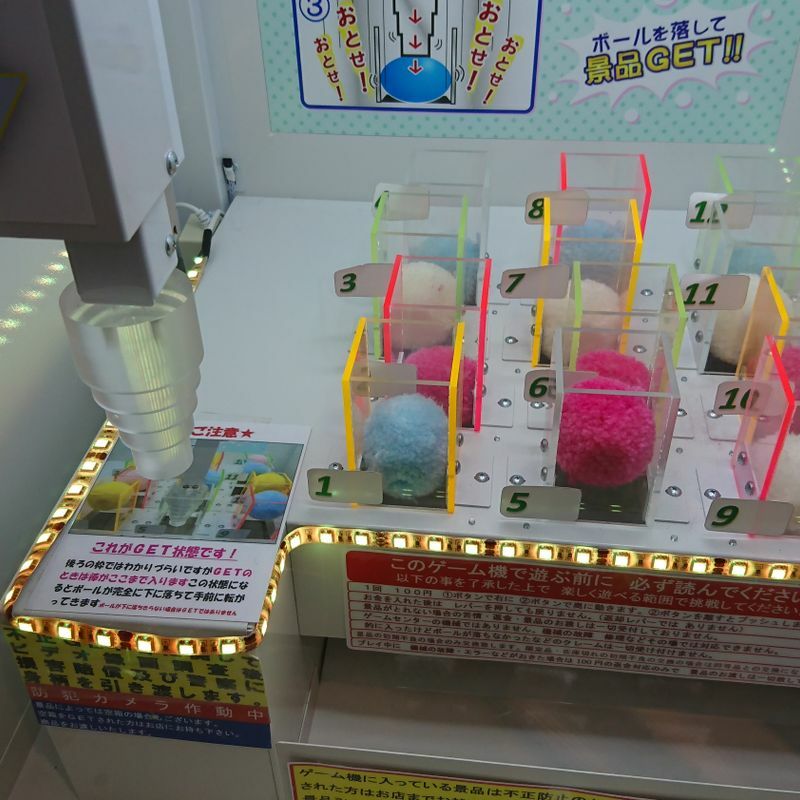 Finally, here is one more type of those catcher/crane game type machine that I want to talk about (the last one for now, I promise... until the next one anyway). Interestingly, you don't really find these at the typical game centers where tons and tons of prizes can be won. Instead, you might find them outside some shops with products aimed for youths like Village Vanguard, at a video game store, or even at an airport. The point of these machines is not to attract a bunch of people and have them go from machine to machine and let them go home satisfied with a prize or two. Instead, they are catching the one or two idiots who think they have a shot at it and start putting in coin after coin for chances towards the impossible. Idiots like me. What makes these machines impossible is the design. The idea might be as simple as pushing a ball into a hole, or shooting 5 sticks down, but there is always more than what meets the eye. Pushing the ball down isn't that simple, because the pusher you are using actually has several stacks of various sizes. The smaller end of the stick might be able to push the ball at first, but to get it all the way, you gotta hit it with the thick end, which I believe should just barely fit into the hole but has never successfully proved. It is, in other words, extremely extremely extremely difficult. So why do people (like me) try it? It's because of the prizes. 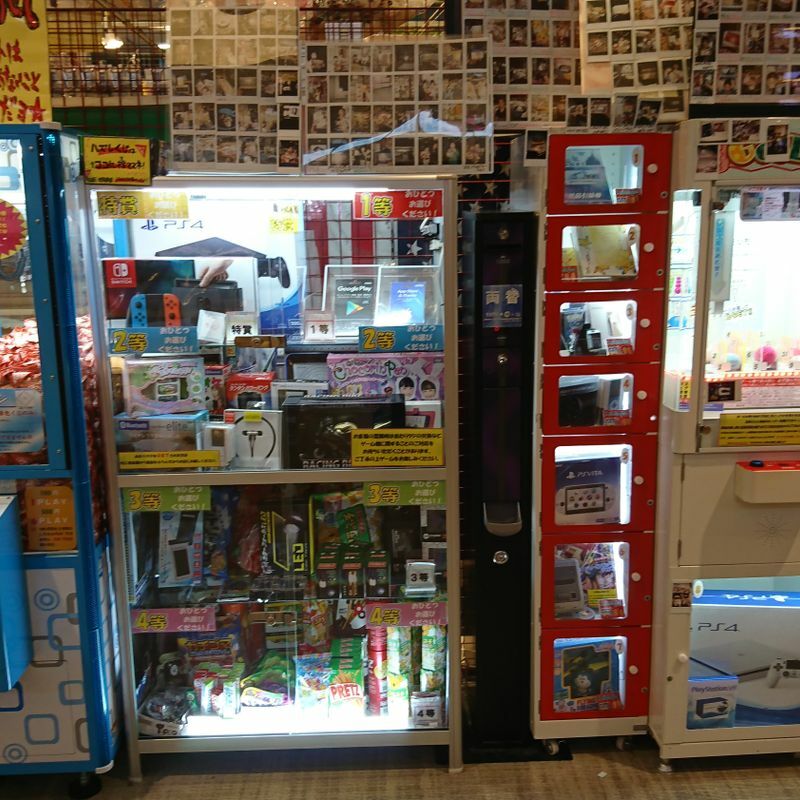 When the Nintendo Switch just came out and was out of stock almost everywhere, a store had one of them inside the display cases right next to these impossible machines! So there I was, trying and trying until a couple thousands of yen have been spent, and I still fall for them. Oh by the way, if you see an empty box and think "hey, someone managed it recently!" Let me tell you that the shop left one of the display cases empty just to give you hope, so that they can then destroy it. Haha! Too funny! I don’t play those games though. They evoke too many emotions. First anxiety then frustration then hopping mad.... so best to avoid them.